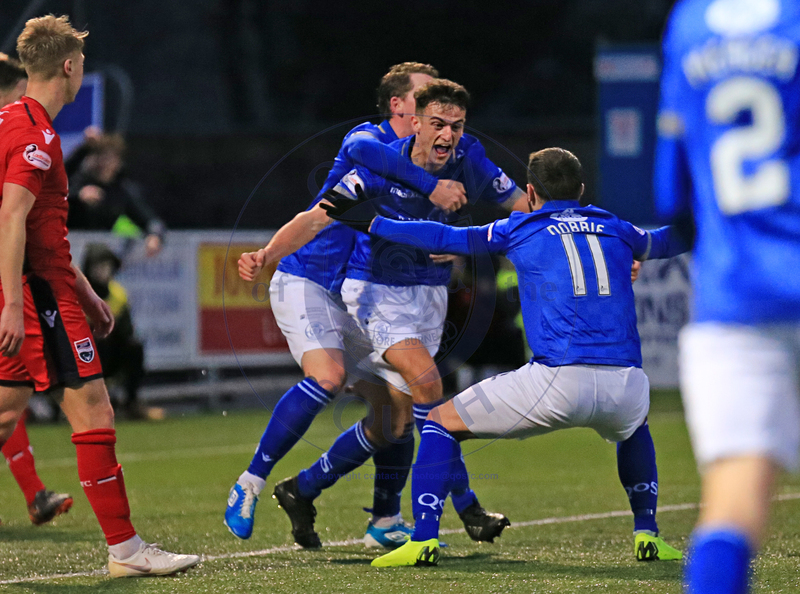 Gary Naysmith`s 100th game in charge of Queens couldn`t have been scripted any better as his team ran out comfortable winners over league leaders Ross County and in the process, recorded their biggest ever win over the team from Dingwall. In an open and entertaining first half during which both teams created and squandered several opportunities, it was Queens who found the scoring touch and took a 2-0 lead into the break. 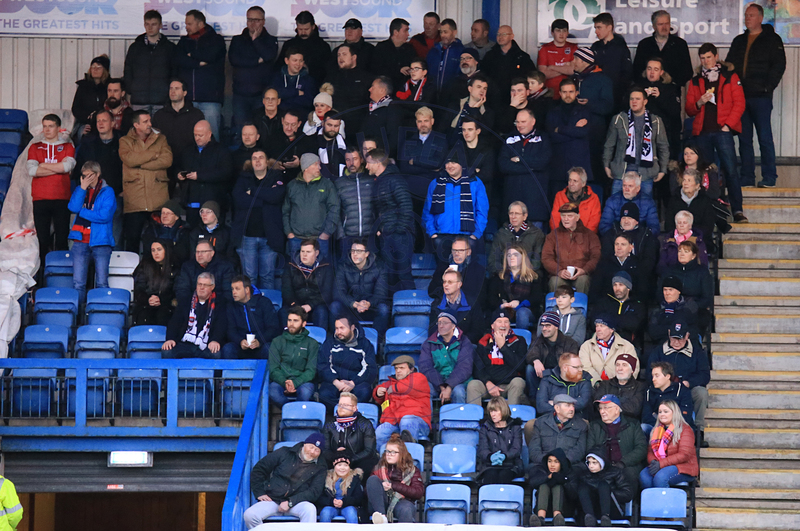 As expected, the start of the second half saw the visitors try to find a way back into the game, but they never really looked as though they believed that a comeback was on, and Queens wrapped the game up with two further goals to move back into the final play-off position. 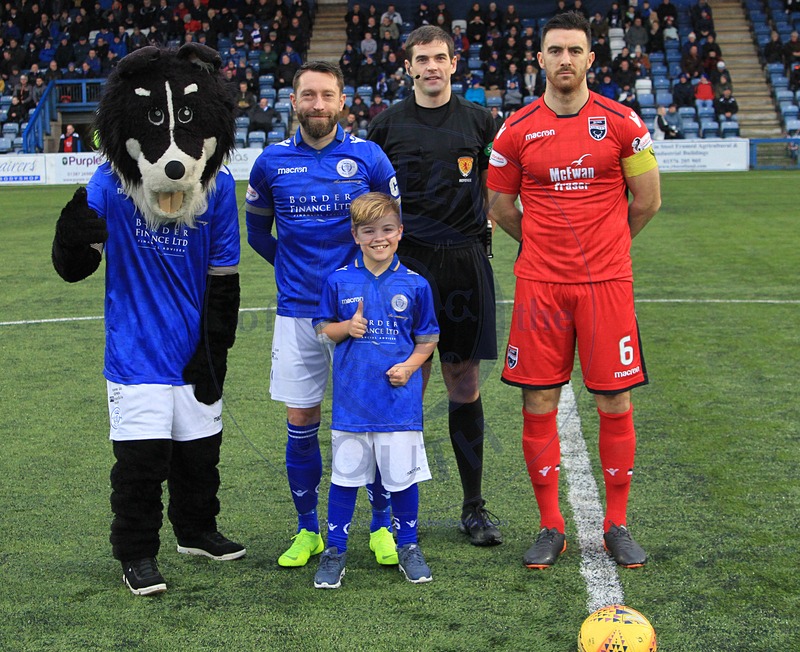 The first home game of 2019 saw Queens hand home debuts to both Nicky Low, and Barry Maguire with Motherwell loanee Maguire also making his first start . Queens lined up against table toppers Ross County in their usual 4-4-2 formation which saw Mikey Doyle continue on the right side of midfield. The visitors were much depleted by a series of injuries and suspensions, and no fewer than 5 players who played against us in the goalless draw back in September were missing from their line-up today. The visitors started well and a cross shot from Gardyne threatened to creep inside the far post as the unsighted Alan Martin seemed uncertain about the balls trajectory. The opening 10 minutes was rather like a basketball match as both teams took it in turns to attack. Callum Fordyce went close with a header, and County responded when a shot from Spence flew narrowly wide. 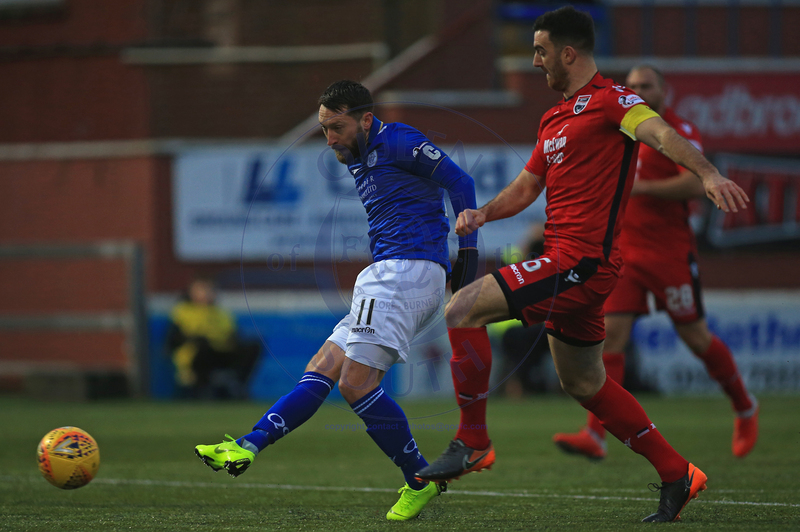 Queens went forward again and after winning possession Nicky Low fed Stephen Dobbie on the left and his instinctive first time half-volley didn`t miss the target by very much. 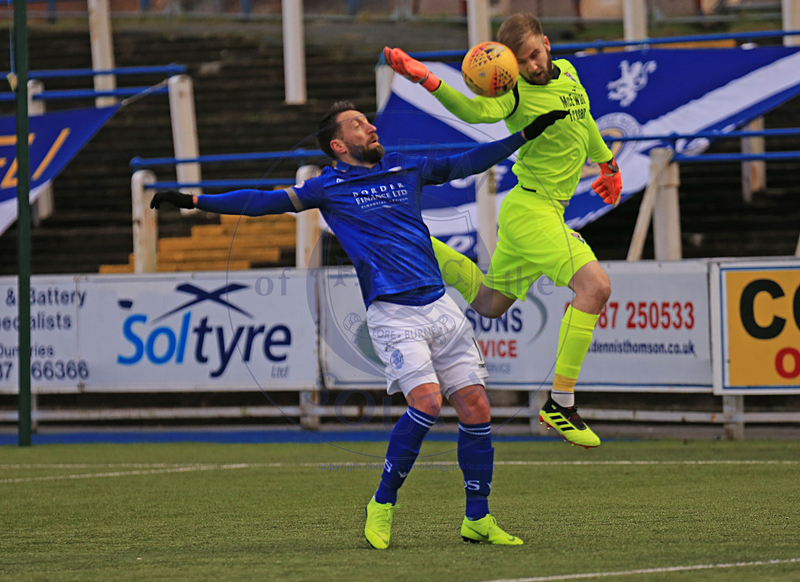 The better of the chances in that frenetic opening spell fell to Queens when defender Watson was short with his back pass, but although Dobbie was quick to latch onto the ball, County `keeper, Scott Fox saved well to prevent Dobbie from opening the scoring. The former Queens `keeper did very well on that occasion, but minutes later he was picking the ball out of his net as Queens made the breakthrough. 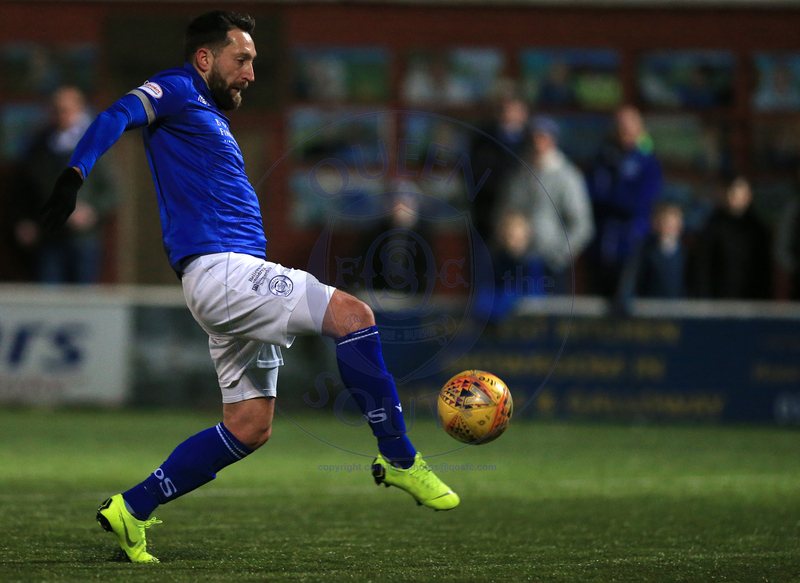 Nicky Low picked out a superb pass that found Stephen Dobbie who took one touch to control, and a second to dispatch the ball beyond Fox to claim his 31st goal of the campaign. The visitors responded well and a poor defensive clearance on the edge of the Queens box fell nicely for Stewart to hit on the half-volley, but thankfully with Alan Martin looking on, his effort was only inches wide from levelling the game. New signing, Nicky Low was certainly impressing,and his tenacious attitude, reading of the game, and excellent passing ability, was already endearing him to the Queens faithful, and he was at the heart of most of Queens forward play. As the game continued to be very open, further chances came and went for both sides. A header from Stewart following a corner went close, and then an excellent flowing move that cut right through the Queens defence carved out an opportunity for Spence, but from just outside the penalty box he could only curl his shot wide of the far post. 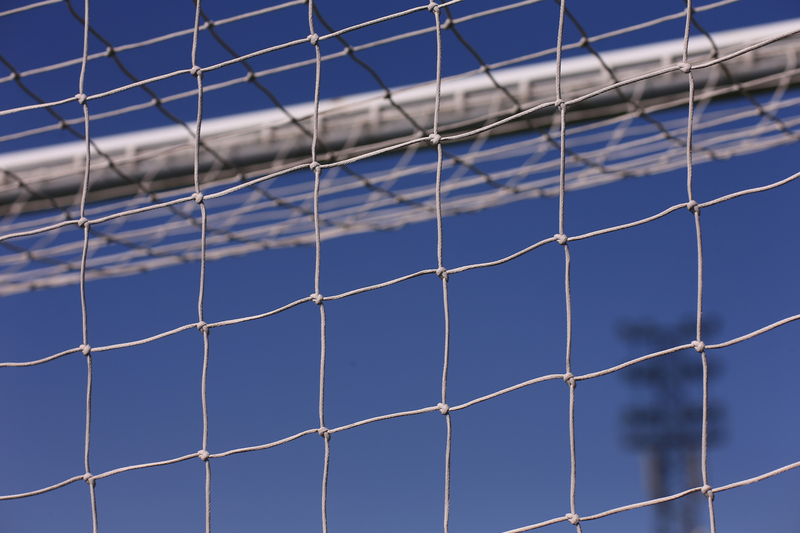 On 26 minutes, Queens had two attempts in quick succession to extend their lead, but in the continued duel between Fox and Dobbie, it was the County `keeper who came out on top, blocking both attempts to keep his team in the game. A moment of controversy arose just past the half hour mark when a pass back to the `keeper was mis-hit into the air by the `keeper who then when challenged by Dobbie, quite clearly used his hand to punch the ball clear, which should have resulted in an indirect free-kick for Queens, however, both the referee and his assistant decided that nothing was wrong !!. There was no doubting that the visiting `keeper was having an inspired game, and he pulled off a stunning save to once again deny Dobbie after Lyndon Dykes and Dobbie exchanged a series of passes to create a chance for Dobbie, but Fox somehow got down to keep out Dobbie`s volley. Not to be outdone by his opposite number, Alan Martin then produced an equally good save after a break down the right from Mullin saw him whip a cross into the near post for McKay, and although his first time flick was certainly on target, Martin got down well to block the shot. the Queens man showed excellent composure to close in on goal before drilling a low shot past Fox, providing the required finish to what was an excellent Queens move. So in a half in which both teams created plenty of opportunities, it ended with Queens well on top and being given a well deserved standing ovation as they left the pitch for the interval. The second half began with the away team being presented with an early chance to reduce the deficit when a foul by Low gave them a free-kick from a decent position some 30-yards from goal, but with both Gardyne and Mullin standing over the ball, it was the latter who took aim and promptly put the ball high over the bar and into the Terregles Street terracing. Moments later some neat footwork saw Gardyne create a chance for himself, and he was slightly unfortunate to see his shot skim the bar as the away team continued to push for a way back into the game. The best chance in the opening phase of the second period fell to Josh Todd, who was very unlucky to see his right foot shot just slip past the near post. Loan signing Barry Maguire was having a reasonably comfortable first start, although he will probably have something of a sore head after been clattered in the box following a Queens corner, but that pain would have been lessened when on 65 minutes he added a third goal for Queens. An impressive move down the left involving Jordan Marshall and Josh Todd ended with a cross into the box looking for Dykes being deflected behind for a corner. 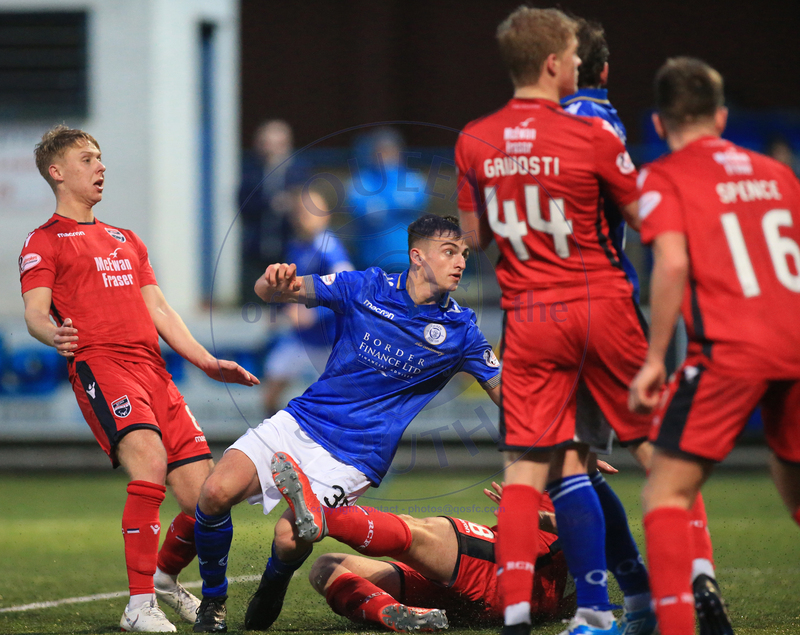 The set-piece delivery from Scott Mercer was sent deep to the back post where Callum Fordyce headed the ball back across goal and on it`s way out, a slight deflection gave Queens another corner. 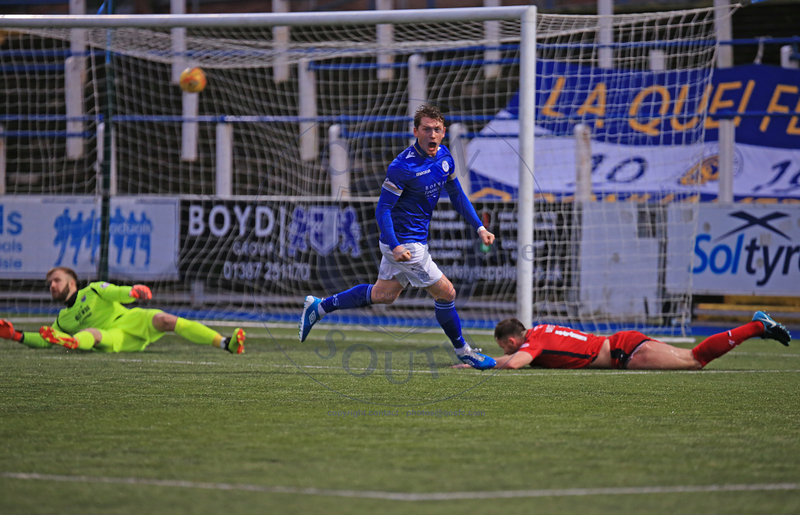 This time in a repeat of the previous routine, Fordyce`s header into the crowded middle of the goal,was met by Barry Maguire who reacted quicker than anyone to smash the ball home from close range. Josh Todd became the first Queens player to be booked- rather harshly as he had the ball driven at him when backing off from a free-kick, but just a minute later things went from bad to worse for the league leaders as they were reduced to 10-men for the final 22 minutes, when Josh Mullin was given a straight red card for a late challenge on Maguire. Kyle Jacobs then picked up a needless booking for pulling back his opponent in midfield as the game slowly descended into Queens being more than happy to knock the ball around for fun, and the visitors realising that the game had gone. 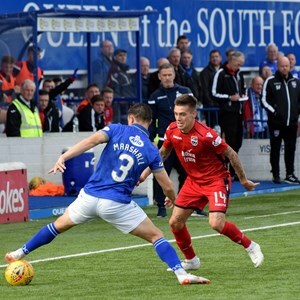 The scoring wasn`t finished though as Queens were able to pull the 10 men all over the place at will, and after a few spells of `Ole` football seldom seen at Palmerston,a fourth goal was added on 77 minutes when Queens went `route one` from Alan Martin`s long clearance and Stephen Dobbie was able to out muscle defender Draper to fire the ball past the despairing Fox. 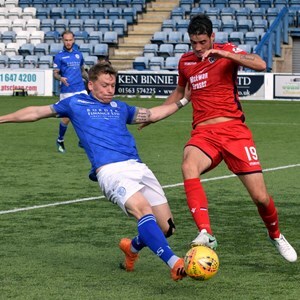 Queens managed the final moments by introducing Andy Stirling, Connor Murray, and Owen Bell, and Stephen Dobbie chasing yet another match ball, had two on target efforts blocked as Queens continued the start to their centenary season by making it successive league wins for the first time since October. Not surprisingly, Sir Stephen won the man-of-the-match award, but this was an exceptional all round team performance and there would have been many candidates today as every player performed at a high level as Queens became the first team this season to score 4 goals in a league game against pre-season title favourites, Ross County. What an exceptional way to begin our home fixtures in this our centenary season, and here`s hoping for more of the same.